I recently returned from my family’s annual spring trip to Florida, and unlike years previous I didn’t get any special time set aside to bird this time round. That was largely due to the vagaries of a single rental car and two young children, but it wasn’t so bad. Florida is perhaps the one place in the United States where you can rack up a pretty great list of birds, including some of North America’s most impressive species, simply by walking down the sidewalk for an hour or so. My “birding”, such that it was, consisted mostly of morning walks with my young daughter in her stroller. She’s a fine birding companion, and mostly falls asleep after awhile, so we got to spend a fair bit of time around the shrubby margins of the many ponds near the hotel. The birds were what you’d expect. A nice assemblage of waders, including my first encounter with the newly minted ABA 2015 Bird of the Year Green Heron. A single Roseate Spoonbill on a couple days was a nice surprise, as were the increasing number of Wood Storks in the area. I’m not that old, but I have been in this birding game for 20 years and even I can remember when Wood Stork was a choice bird in central Florida. Now they’re regularly seen foraging in the weeds along the golf course and soaring overhead with clouds of vultures. Nothing spectacular, but solid, enjoyable birding. It was on the last day, though, that I got an encounter with one of Florida’s most spectacular birds and, let’s be honest, one of the most spectacular birds in the world. My daughter and I walked down a sidewalk that we had skipped on days previous, so that I could have a look at a large pond that might host some waterfowl of some sort. 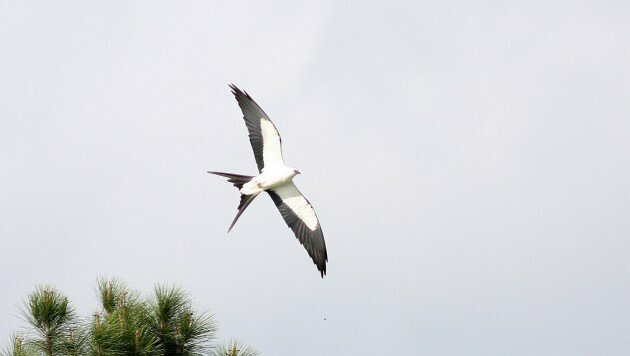 I glanced over to my right to see a sleek black and white raptor crest the horizon and dive back down behind a row of trees on a nearby golf course. 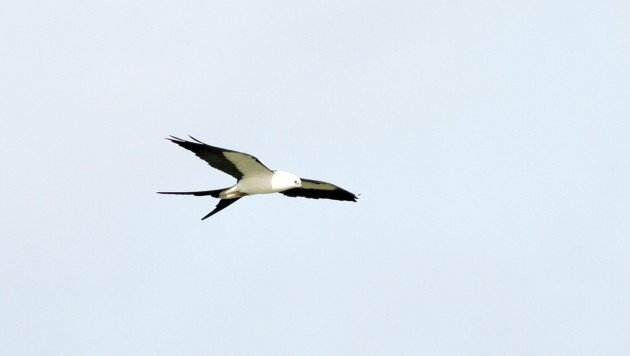 Swallow-tailed Kite. Delicate, elegant, and effortless. It rose and fell along a row trees seeking out flying insects. 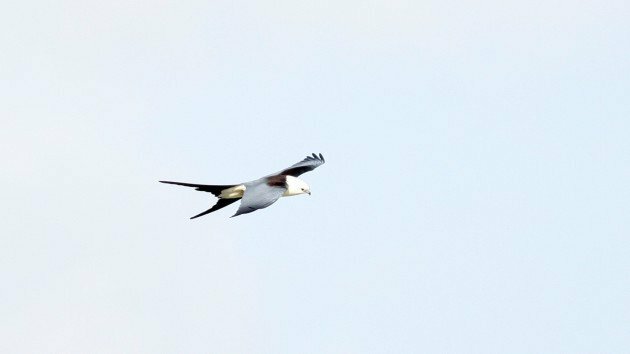 I don’t always see Swallow-tailed Kites on our trips to Florida, even when I go out specifically for birding. I guess our early March time-frame is a tad on the early side for them to return from South America, so you can imagine I was pretty stoked to see this one. There are few birds in North America that can elicit a subconscious smile in every single birder regardless of experience or skill, but this one has to be it. It has, as Felonious Jive would say, the economy of style. Black, white, and gray aren’t flashy, but tie it to those pointed wings and epic tail and you’ve really got something. 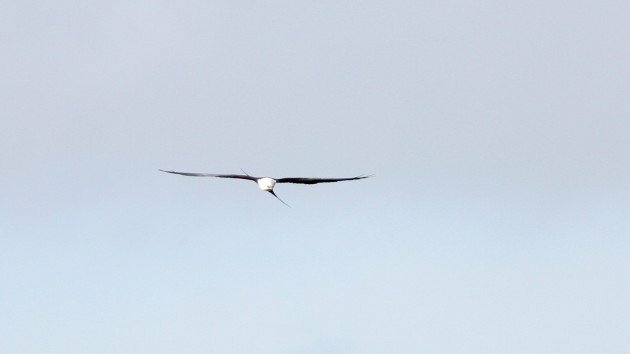 There is nothing on earth that seeing a Swallow-tailed Kite can’t make better, and you can’t say that about many birds. My only regret in all of this, and it’s not an insignificant one, was that I had neglected to reset my camera before this thing came upon me. So what should have been a crushing of considerable proportions turned out to be a little wanting. Turns out that shooting a mostly white bird against a bright white Florida sky is not as easy as it looks. Even so, the precious few minutes this bird was in front of me turned what had been a pedestrian morning stroll into something exceptional. Cool! One of my favorite birds. I have seen them a couple times at Corkscrew Swamp Sanctuary as early as mid-late February. This is a hurtful species for WP birders. Imagine you saw a Wallcreeper in the ABA area and were only able to spread the news well after the bird is gone – your fellow birders would not be so happy, ey? I think it is one of the most stuning birds of prey going. I’ve seen them in Central America and they are amazing. Jochen – love that story. I saw a rare vagrant in South Africa, at least for that part of South Africa. Really should get around to reporting it. Birding in the Silly Season.